I thought you all might like to see the oyster stitch that I have come across. It is an amazing stitch for flowers. 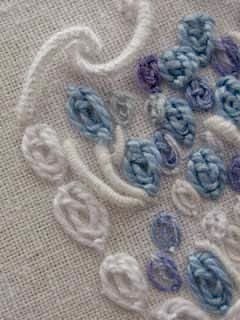 Now it is not the easiest of stitches but with a little practice is a beautiful embroidery stitch to use. You can look up a tutorial on google and watch it being done, which I find great to do. I thought that I would try and show you different stitches that are out there and which will bring new dimension to embroidery work. You can just imagine these lovely stitches in all colours for a border of flowers can't you? This is the diagram for the stitch. As I said you can watch a video of how to on google just type in oyster stitch and voila! I hope you have a go........ Let me know? Have a happy stitching day today and learn a new stitch!